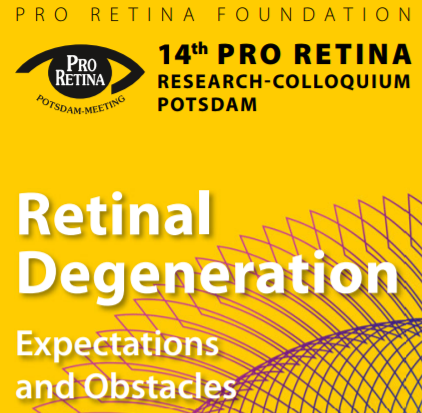 February 25th 2019 is the registration deadline for posters for the 14th International Research Colloquium on Retinal Degeneration, to be held in Potsdam on March 22nd-23rd 2019 by PRO RETINA Germany. Over two half-days, an interdisciplinary dialogue will address the expectations for current and future therapies in inherited retinal dystrophies. There will be a focus on obstacles and challenges of potential therapeutic pathways as a prerequisite to further improve performances in treating this important and sight-threatening group of ophthalmic diseases. Specifically, three plenary sessions center on molecular diagnostics and gene therapy in retinal dystrophies, on retina chip technology and optogenetic approaches and finally on cell substitution for restoring visual function. Distinguished national as well as international experts in the field will present critical reviews on state-of-art and future directions in the quest to bringing the most powerful and efficient treatment to the patient. This year’s keynote lecture will be given by Prof. Rando Allikmets from Columbia University in New York who will emphasize the importance of mutational effects and how such effects critically may influence gene therapy performance. Senior and junior basic scientists as well as clinician scientists, clinicians and patients, will have the opportunity to learn about recent advances but also to exchange bold and challenging ideas which may further advance the field. PRO RETINA Germany, founded in 1977, is a patient organization with a longstanding commitment “to encourage ophthalmic research, to battle disease and to ensure a self-determined life of persons with retinal degeneration”. In continuation of its many activities in supporting these goals, PRO RETINA Germany also sponsors the Potsdam meeting series since its beginnings in 2005.